Thread: You can do so much with recipes! I just love this section. You can have so much fun with your recipes. You can add the recipe and a photo and when you made it. Or if your mom had a certian holiday food that she only made for Thanksgiving you could add to your page. I do Kitchen shows with the Pampered Chef and this is a great way for my host to remember the great food and wonderful time they shared with their friends, plus I or they could add in the recipes. I also read how you could just do a recipe scrapbook with all your and your familys favorite recipes, this way you can hand it down to the cook in the family once they move out on their own. This also could be great to give as a gift, make the page and photo copy it and then you could get more for your money and time. Everyone loves something handmade. 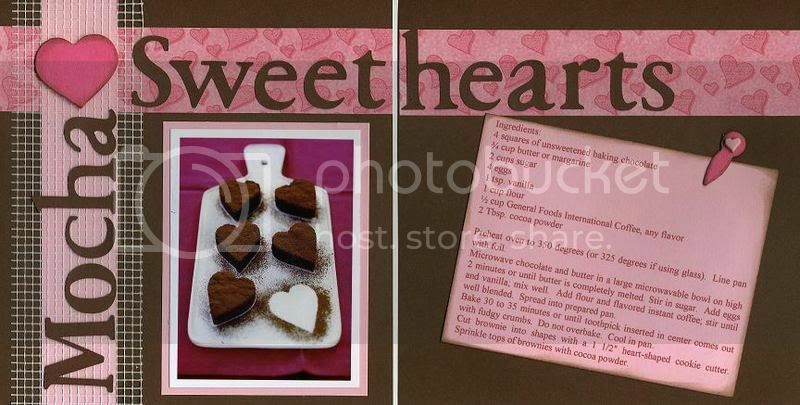 That so cool I never new you could mix scrapbooking and cooking. My two loves in one. WOW I'm goin' have to get on that scrapbook cookbook idea. Thanks, I'll let you know how it turns out. I think I'll make her one for christmas. I am working on one of those Heritage Family Cookbooks now and it is awesome. I mailed out acid free recipe cards to family members - requesting their recipe they are known for. Plus, asked many to send a current picture. It's amazing how many have actually done this for me. This way I have the recipe card in their handwriting! What a great idea...mixing talents! I will take some pictures of the recipe layouts for my swap when they come in and see if I can remember how to post them to the photo album thingy. Here's the link to one of the ones I did for Cindy's swap. It was a lot of fun. I'm planning to continue adding to whatever I get back from the swap or maybe do more swaps on this.